Difference between revisions of "Grindhouse"
The films are also connected by a DJ playing a song in tribute to [[Jungle Julia]] during Planet Terror. This implies that they both take place in Texas and Planet Terror takes place AFTER Death Proof. NOTE: Death Proof's second half takes place in Tennessee. The Grindhouse Double Feature experience contains age restriction cartoons, fast food ads ([[Acuna Boys Tex-Mex Food]]), alternate studio and film title cards (Rodriguez International Pictures, Dimension Films) that put the two films in a supercool retro 70s atmosphere. The fake trailer for the film [[Machete]] plays before Planet Terror and the other three trailers ([[Don't]], [[Thanksgiving]] and [[Werewolf Women of the SS]]) play before Death Proof begins. To find out more about the trailers, see "Trailers" in the Menu to the right. 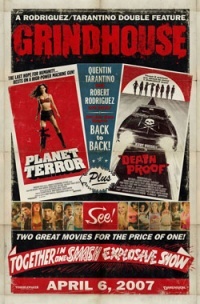 Grindhouse is a theatrical experience created by Robert Rodriguez and Quentin Tarantino, comprised of a double bill of their two movies Planet Terror and Death Proof, along with a number of fake trailers and other visual additions that aim at recreating the theater-going experience of the 70s. This old school "Grindhouse" double feature was inspired by a classic exploitation poster for a double bill of the American International Pictures films: Drag Strip Girl and Rock All Night. Both Robert Rodriguez and Quentin Tarantino owned a copy of this poster and Robert was inspired by it to do two genre features back to back with Quentin. Quentin has been a longtime fan/collector of 70s Grindhouse genre films himself. While growing up in LA he would spend many nights at drive-ins and inner city "grindhouses" watching kung fu triple bills, Italian horror films, Crime films and other wild and crazy genre films. For the last decade he has held his own film festivals in Austin, Texas where he shows many classic Exploitation films from his personal collection. Most Grindhouse genre films were heavily promoted and they often had very colorful and attractive theatrical trailers and posters. Often times the films themselves were not as exciting as the posters which were created to give an outrageous scope to the films storyline and characters. In regards to Grindhouse, Tarantino states: "We're going to make 2 sleazy Grindhouse movies that deliver on their posters!". Longtime fans of Grindhouse films, most notably modern day film geeks who missed the heyday of the Grindhouse experience will be able to get a taste for what it was like to buy a ticket for a double feature of graphically intoxicating feature films that were shown either on NYC's 42nd Street, Downtown LA or in other city's across the country. Grind House is Rodriguez's Planet Terror, a subgenre zombie movie (Infected peee-ople!! ), followed by Tarantino's Death Proof, a Southern Fried slasher-car chase-girl gang film. In some countries, the films will are released separately, with Planet Terror extended by 20 minutes, and Death Proof extended by 30 minutes. The extended footage can also be seen on DVD. The Grindhouse Double Feature experience contains age restriction cartoons, fast food ads (Acuna Boys Tex-Mex Food), alternate studio and film title cards (Rodriguez International Pictures, Dimension Films) that put the two films in a supercool retro 70s atmosphere. The fake trailer for the film Machete plays before Planet Terror and the other three trailers (Don't, Thanksgiving and Werewolf Women of the SS) play before Death Proof begins. To find out more about the trailers, see "Trailers" in the Menu to the right.